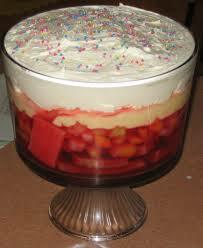 I have long admired the trifle. It is the crown jewel of English sweets. I often remember it at Christmas. I felt a bit of nostalgia for the trifle when I lived in America. My memories are often connected with Milton Keynes since that’s where we moved when we “immigrated” from Northern Ireland. I put immigrated in quotes because of the technicality of immigrating. But really, it was an immigration. Northern Ireland and England are two different cultures and countries. Of course they both speak forms of English but that doesn’t make them similar. Or at least completely similar. There is a lot of Scottish influence in Northern Ireland. And also Irish. Of course the Irish and Scottish are similar and also different. That’s the troubles. The English separated the Scottish and Irish and encouraged them to fight each other and then called it tribalism. A familiar tactic. It is called divide and conquer. No matter. Here is some more about trifles. Northern Ireland has trifle cakes too. And now that I am here, I hardly eat it. It is not as good as I remembered it. But then again what is. Everything is different from childhood. Smaller and less tasty usually. But the memory of something is often better than the actual event, object, or, in this case, food. The trifle is the queen of English sponge cakes. Do you know how to make this cake? It is not too difficult. It is the strip tease of cakes.